Fort Lauderdale, FL – The average price of a gallon of regular unleaded shot up about a nickel during the past week, according to the latest weekly release from the U.S. Energy Information Administration. Steep price increases in California and across the midwest, coupled with smaller increases across the gulf coast states, dragged the U.S. price average up to $1.78 per gallon. The average price of diesel notched upward about a penny per gallon to settle at $1.99. Prices held steady across most of the east coast but edged up in all other regions, according to the E.I.A. Fort Lauderdale, FL – Gas prices across the country fell again during the past week, according to the U.S. Energy Information Administration. 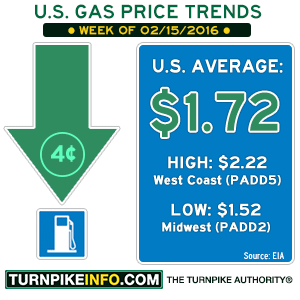 The average price of gas declined four cents to settle at $1.72 per gallon. Prices were flat in the midwest, but the cost of fuel declined in every other region. For drivers across the west coast, prices fell an astonishing ten cents per gallon. The price of diesel fuels finally fell through the $2.00 level, settling at $1.98 per gallon for a nationwide average. In a peculiar twist, prices along the central Atlantic states are higher, on average, than the west coast averages this week. Typically, west coast prices are the highest in the country. Editor's note: The President's Day holiday on Monday, February 15, 2016, delayed the EIA report by one day. Fort Lauderdale, FL – Gas prices plunged another six cents during the past week. The latest report from the U.S. Energy Information Administration shows the average price for a gallon of regular unleaded has fallen to $1.76, with the cheapest prices in the country already closing in on the $1.50 mark. The price of diesel fuels is on the verge of falling through the $2.00 floor, as average costs settled just under $2.01 per gallon during the past week. For both gasoline and diesel prices, the highest prices are found on the west coast, and the midwest region traded places with the gulf coast states this week to become the least expensive place to buy fuel. 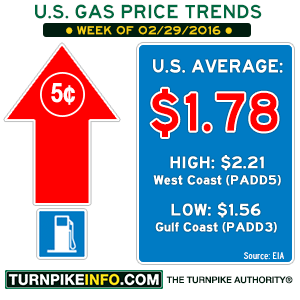 Fort Lauderdale, FL – The price of gas continued its downward trend during the past week. According to the weekly petroleum update from the U.S. Energy Information Administration, the average price of a gallon of regular unleaded is down to $1.82. As with previous reports, the EIA data show drivers on the west coast and, in particular, California are paying the highest for gas, while drivers along the gulf coast are paying the least. The price of diesel continues to come down, as well, although the national price average has yet to break through the $2.00 per gallon threshold. The EIA report shows the weekly diesel price dropped to an average $2.03 per gallon. Editor's Note: The graphic on this article has been modified. The date was corrected from 1/25/2016 to 2/1/2016.